My dinner companion fancies himself something of an interiors aficionado and insists on categorising any space as soon as he’s in it. Within seconds of being shown to our booth, he’s off. “It’s sort of Noughties Vegas Retro,” he decided. “Um, is that a thing?” I asked. “Well,” he considered. “It’s the sort of place you’d go to have it large when Floyd Mayweather was fighting. Proper fights, I mean.” Indeed. 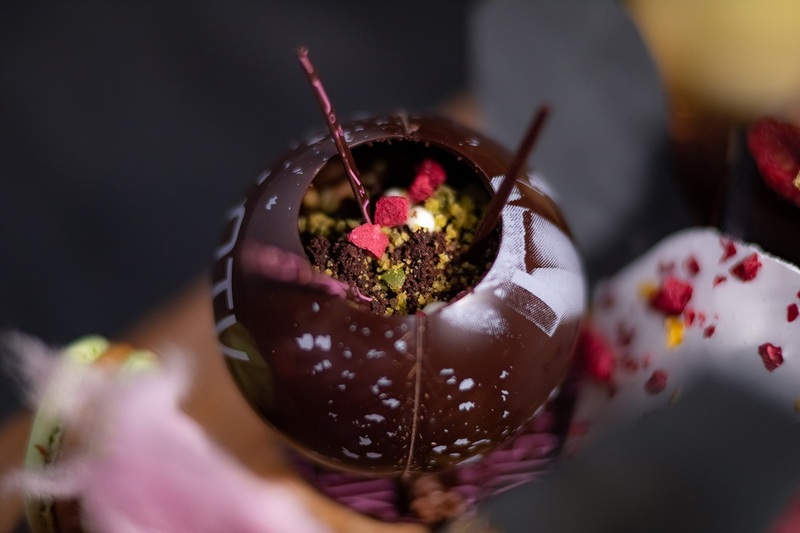 STK London opened about six years ago, marking the brand’s first foray outside of the US (TLE reviewed it in 2015) and since then STK has opened throughout Europe and Asia. 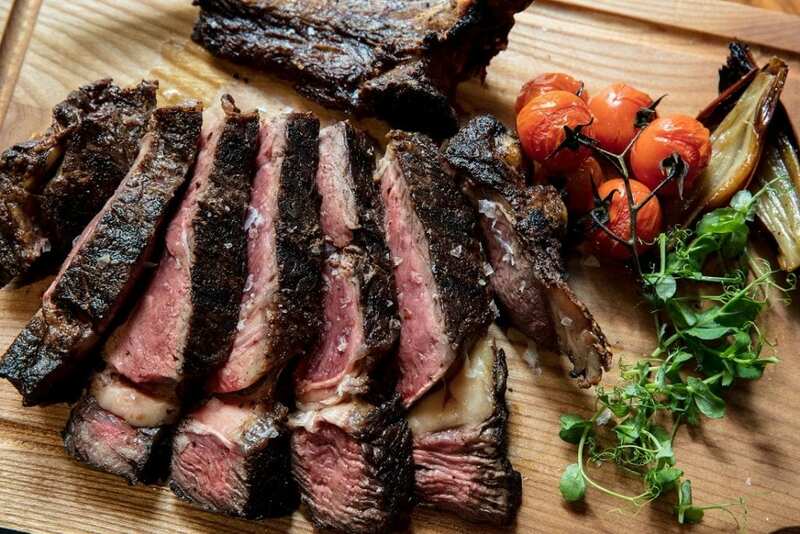 While the likes of Zelman Meats opt for a downhome smokehouse feel, STK is clubbier (particularly on Friday and Saturday nights when a DJ holds court), more dimly-lit (photography was challenging, not that it seemed to put off our fellow diners as they artfully arranged their main courses and snapped away) and unapologetically American; and to my dinner guest’s earlier observation, there is a lot of chrome and leather. But we weren’t here for the fixtures and fittings. Our server seemed hell-bent on steering us towards the fish for our mains but as my pal wryly remarked “It ain’t FSH is it?” Aside from our starters, we were most definitely here for the steak. 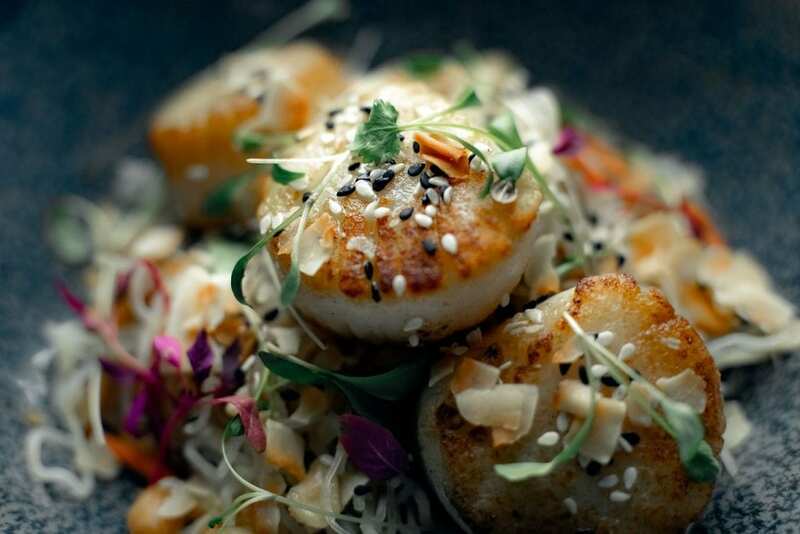 So to kick off – seaweed citrus cured scallops with Asian noodles, mango, chilli and peanut salad and yuzu soy dressing (£15) and Jumbo Lump Crab with cucumber salad and ponzu-mayo dressing (£14). The scallops proved a delightful delivery system for the blend of accompanying flavours; there was ‘chew’ in them, which was briefly unsettling but due more to mouthfeel preconceptions than any shortcomings in the preparation. The crab came in a generous portion and was zesty, fresh and very tasty. On to the mains, and my friend (after much discussion about the ins and out of grain/grassfed beef) plumped for the medium rare 600g (21oz) USDA grain-fed T-bone (£56) with Parmesan truffle chips (£7) and creamed spinach (£5). I chose the 500g (17+oz) USDA grain-fed sirloin (£57) well done, with green beans, smoked bacon and crispy shallots (£6). The T-bone was gargantuan. It all but covered the plate. But its size was matched by its taste. It was delicious – tender and cooked to perfection, with buttery, melt-in-the-mouth fat. He’s a seasoned trencherman but even he was beginning to flag after a couple of dozen mouthfuls. I was happy to help out. I often ask for steak medium or well done. I’ve given up adding “apologies to chef” because, well, I’m the customer. My maternal grandfather, a butcher, who routinely asked staff to “just walk it slowly past the grill” when selecting steak, probably spins in his grave every time I order. But too many restaurants seem to take the attitude that ‘he obviously doesn’t care about his food so neither will we’ and serve up a charred, smoking boot. A decent chef, regardless of how much he or she is irked by my gormless palate, should be able to tolerate this whim. So it’s with great relish that I tuck into my sirloin; there’s a gratifying crunch to the ends, but one gentle cut of the knife is all the steak needs. The STK ‘bold’ sauce adds punch and the fries were plentiful and unfussy (I didn’t sample my pal’s Parmesan truffle chips, which arrived in what Alan Partridge would call a “Jenga-style” formation). We needed a breather after the main course. By now (8pm on a Monday) the place was filling up, with most of the booths and tables full. The clientele was varied; young couples, groups of businessmen, families and people out with friends. 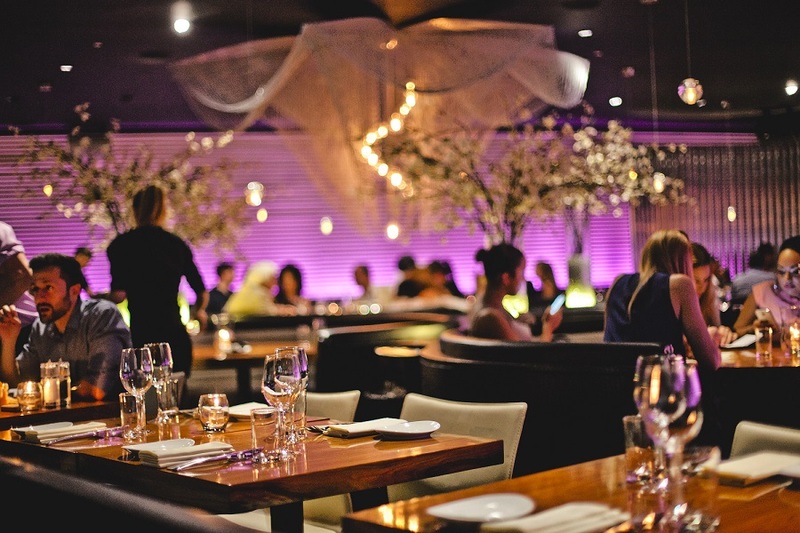 In conversation with various servers, we discovered that there is a high staff retention rate – always a sign of a happy workplace – indeed, several people have been there since STK London first opened its doors six year ago. To the puds, then. I succumbed to waiter Carlo’s entreaties to choose the Chocolate Jar (raspberry cremeux, chocolate mousse and pistachio crumble, £7) and was glad to have done so. Usually I balk at the addition of pistachio to puddings. It seems as oddly out of place to me as eggs in a fish pie (don’t let’s have this argument now). But here it is a great complement to the wonderful, gooey mousse. My pal went for the New York Cheesecake with spiced dried fruit compote, speculos crumble (!) and caramel ice cream (£7), which I would have sampled had it stuck around long enough. A grand feed, as my granddad would have said.